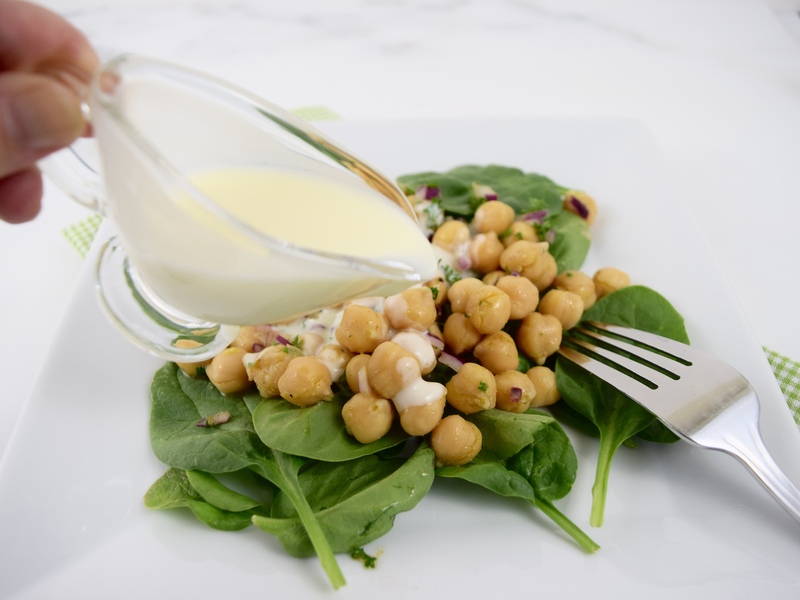 Although, the list of ingredients for this deliciously healthy salad seems long, it contains items most commonly found in the refrigerator and the pantry. I found this easy to make salad in Ellie Krieger’s The Food You Crave, The Taunton Press, 2008. Ellie used to have a show on the Food Network, featuring healthy recipes. It is a shame that her show in no longer on, because she had the only show of this type on the network! I seem to gravitate towards recipes that contain garbanzo beans, cumin, cayenne pepper and lemon juice! 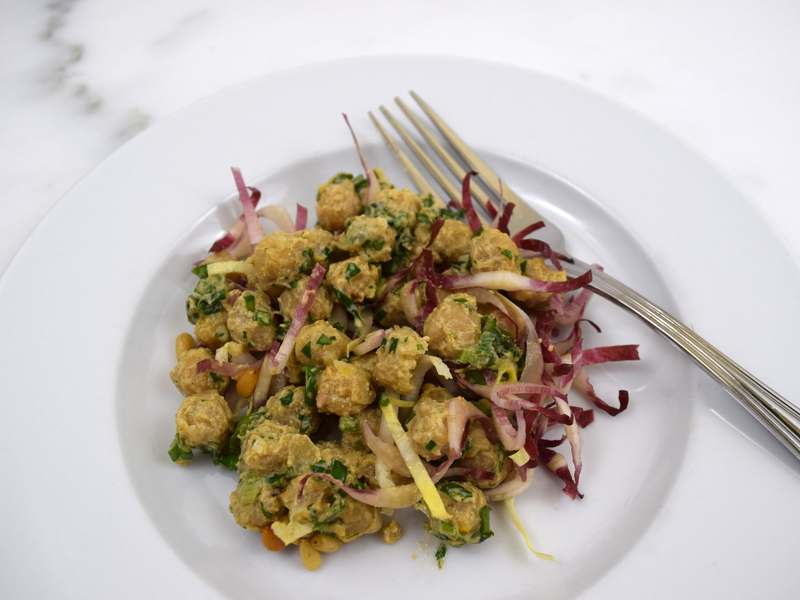 This salad is a wonderful mixture of flavors and textures! Fortunately, most of the ingredients I used were organic and were bought at my local Trader Joe’s. The only change I made to this recipe was I omitted the orange zest, because oranges didn’t look great at the market. Believe me, you won’t miss it, because the salad was so tasty without it! Using a medium bowl, mix together the beans, parsley and onion. In a small bowl, whisk together the oil, lemon juice, zest, cumin and cayenne. Add salt and pepper to taste. Pour dressing over bean mixture and toss well. Using another small bowl, mix together yogurt, orange juice and honey. 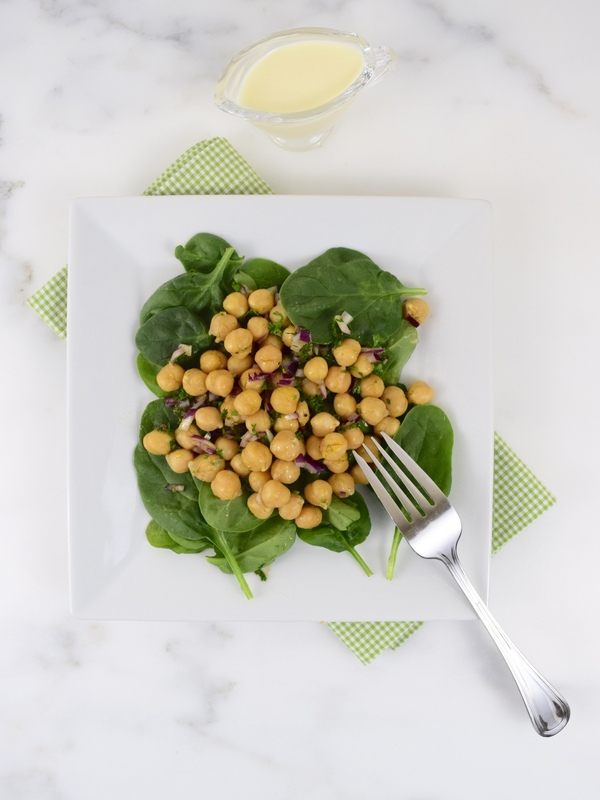 Serve bean salad over a bed of spinach leaves. Top with yogurt sauce and garnish with mint. 4 servings. Since I started blogging, I have become a lover of kale, especially when I can buy it organic, cut, washed and ready to use! 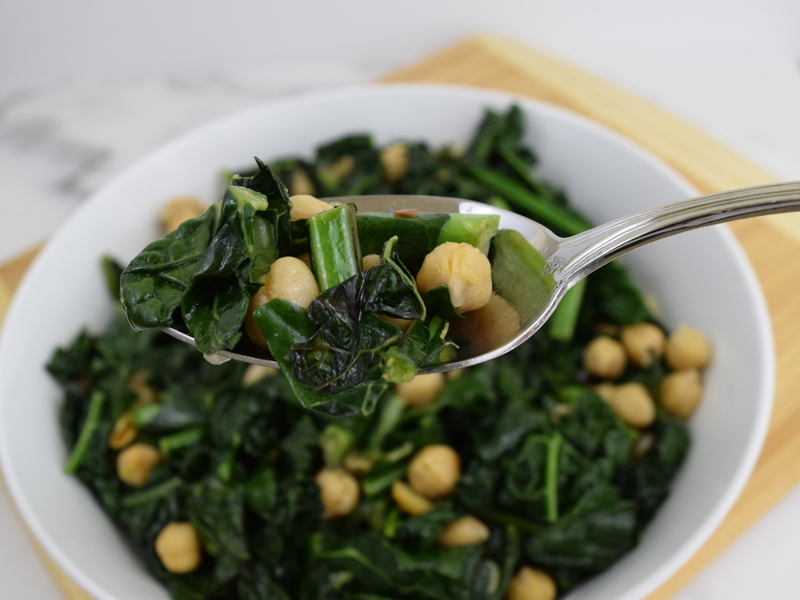 In this hearty side dish, the garbanzo beans helps to balance out the slightly bitter taste of the kale along with the garlic and red pepper flakes. 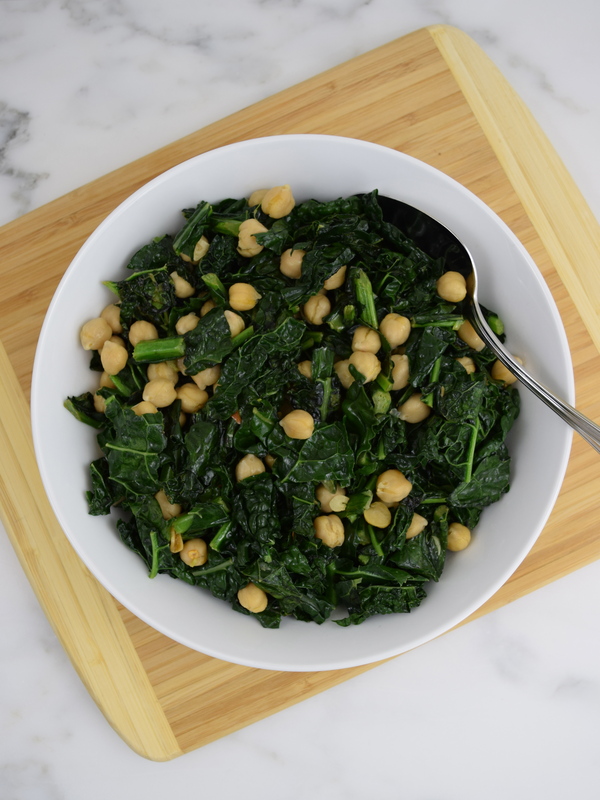 There are only six ingredients to make this tasty and healthy side! I found this wonderful recipe on the Williams Sonoma, Vegetable of the Day, by Kate MacMillan (Weldon Owen, 2012). Warm olive oil over low heat in a large non-stick frying pan. Add garlic and stir frequently, until soft, but not brown for a few minutes. Place half of kale in frying pan. Cover pan and let kale wilt for a few minutes. Add remaining kale and stir, until kale is coated with olive oil. Cover and cook, until kale is tender for 15 to 20 minutes. Stir in garbanzo beans. Add salt and red pepper flakes to taste. Sauté for about 5 minutes, until beans are heated through. Serve immediately. Serves 4. This delicious side dish is incredibly easy to make, but is complex with the different flavors and textures. You can definitely taste the tahini, but also the lemon, garlic, cilantro, green onion, cumin and the red pepper flakes! 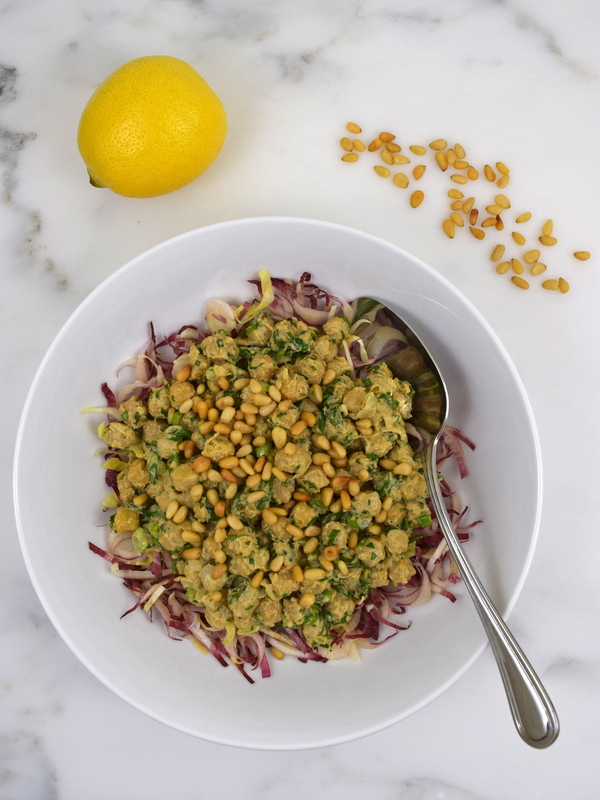 Then you have the firm texture of chickpeas and the crunchiness of the endive and pine nuts all mixed together! It is truly a simple dish to prepare, but full of sophisticated flavors. 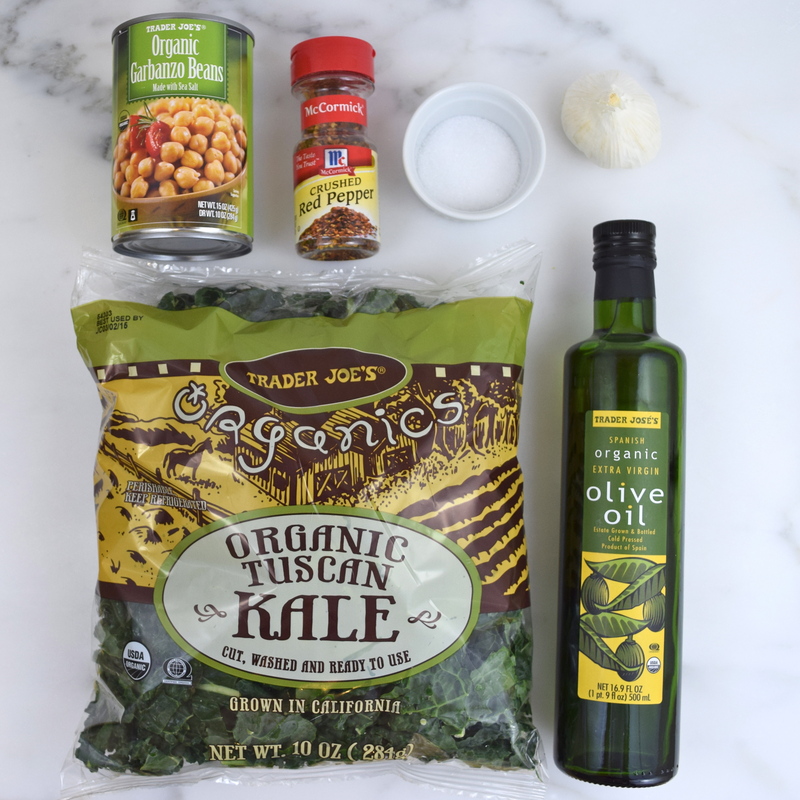 This modified vegetarian recipe came from Oprah Magazine, January 2015. 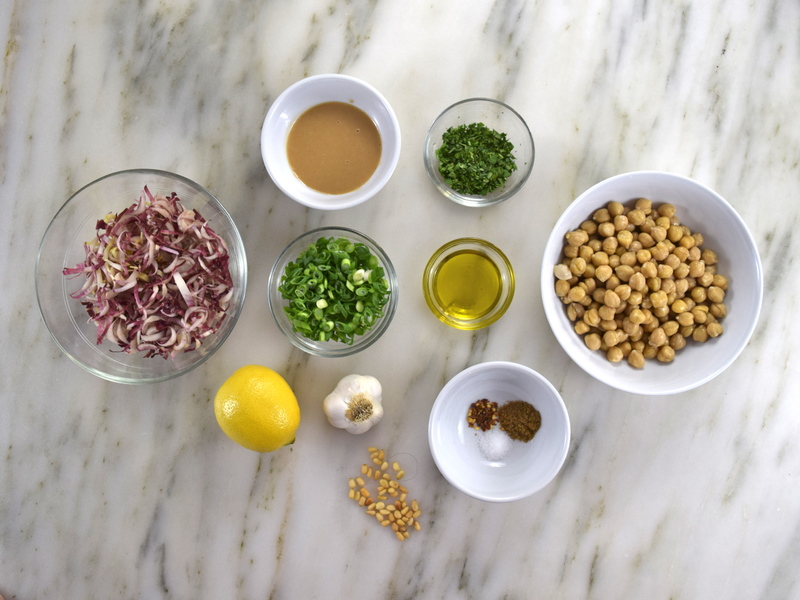 In a medium nonstick frying pan, place chickpeas and cover with water. Bring water to a simmer and heat beans until warm for about 4 minutes. Drain and set aside. Using a large bowl, combine green onions, cilantro, garlic, lemon zest, lemon juice, cumin, salt, and red pepper flakes. 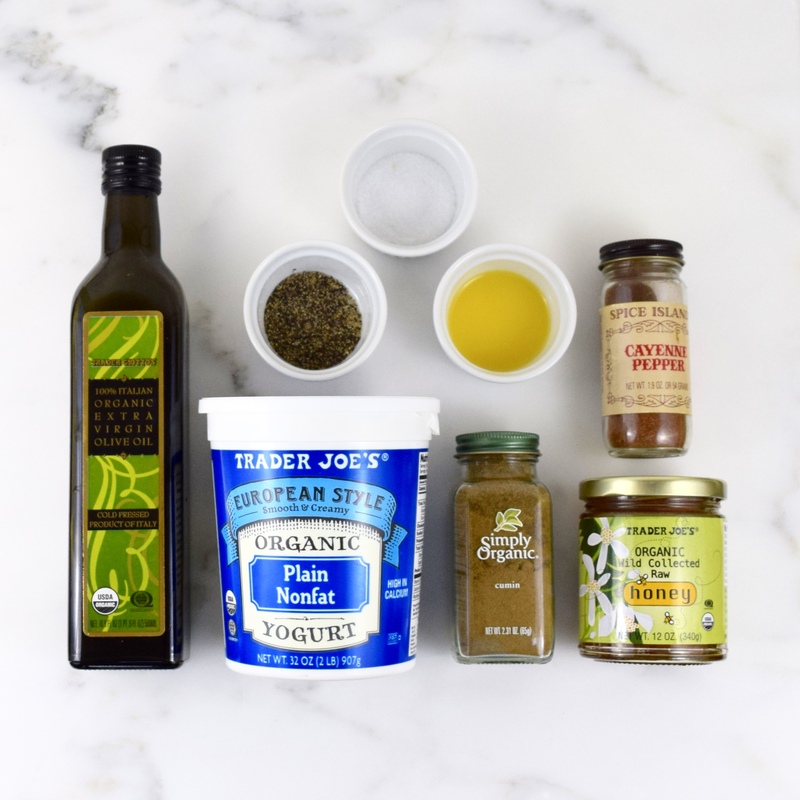 Whisk tahini and olive oil together and mix with the ingredients in the large bowl. 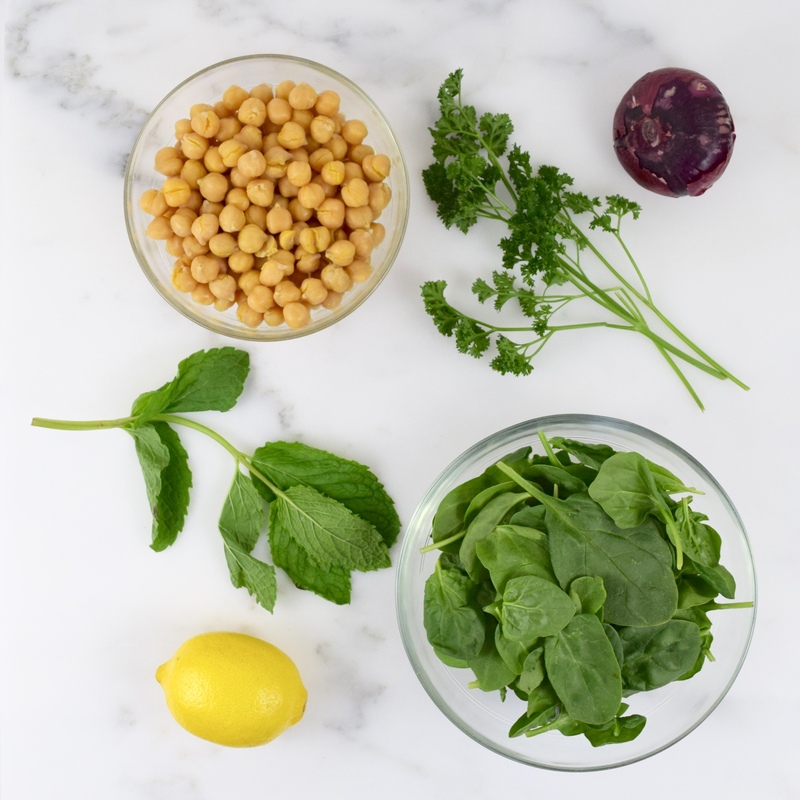 Add chickpeas and gently mix together. In a serving dish, spread the endive. Then add the chickpea mixture. Finally, garnish with the pine nuts and serve. Serves 4. I didn’t realize how easy it was to make your own hummus at home, until I saw Martha Stewart on the “Today” show recently. 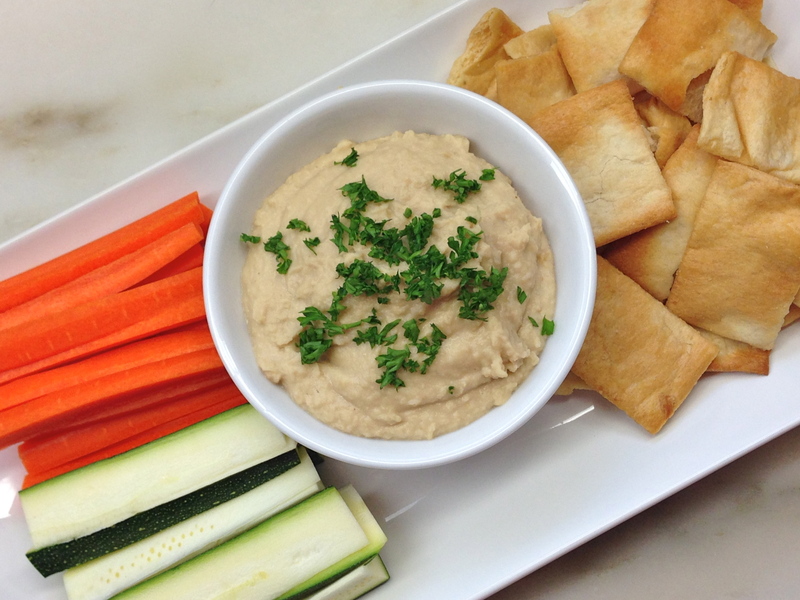 I love hummus and it’s so healthy for you, especially when served with vegetables! Save the liquid from the garbanzo beans. Rinse the beans thoroughly. Place them in the food processor (I used my blender) along with 1/4 cup reserved liquid from the beans. Add lemon juice, tahini, garlic, cayenne pepper and salt to taste (approximately 1 teaspoon). Blend until smooth. Serve with pita chips, fresh vegetables or whatever you like! *I found that I needed to add more liquid.